It has been an absolute pleasure leading the College in my first term of appointment. It is hard to believe Term One is almost to a close with only a week remaining. Thank you for your ongoing support. Together, we are creating a College of which we can all be proud. There are a number of significant events between now and our next newsletter in Week 2 of Term 2. To ensure you have all relevant information heading into the Easter break, I have highlighted some of these details below for your convenience. A reminder that the first two days of Week 1 next term are Pupil Free Days for all students. All staff from the College, along with colleagues from St Mary’s and St Bernard’s will be involved in a two-day workshop with the Berry Street Institute; a Melbourne based organisation. “Berry Street believes all children should have a good childhood. The Berry Street Childhood Institute contributes to this vision by collaboratively building & sharing knowledge, encouraging public dialogue and mobilising leadership”. The program will be delivered over four days. Two days this year, and two days in 2020. Dates and themes are outlined below. School resumes for Term 2 on Wednesday 1 May 2019. ANZAC Day falls during the school holidays this year. On Thursday of the second week, 25 April, I invite our students to represent the College in the ANZAC March. Carroll College has representation each year at the Tuross and Tomakin Dawn Services, and Moruya and Batemans Bay Services. A reminder of specific times will be emailed to families closer to the date. 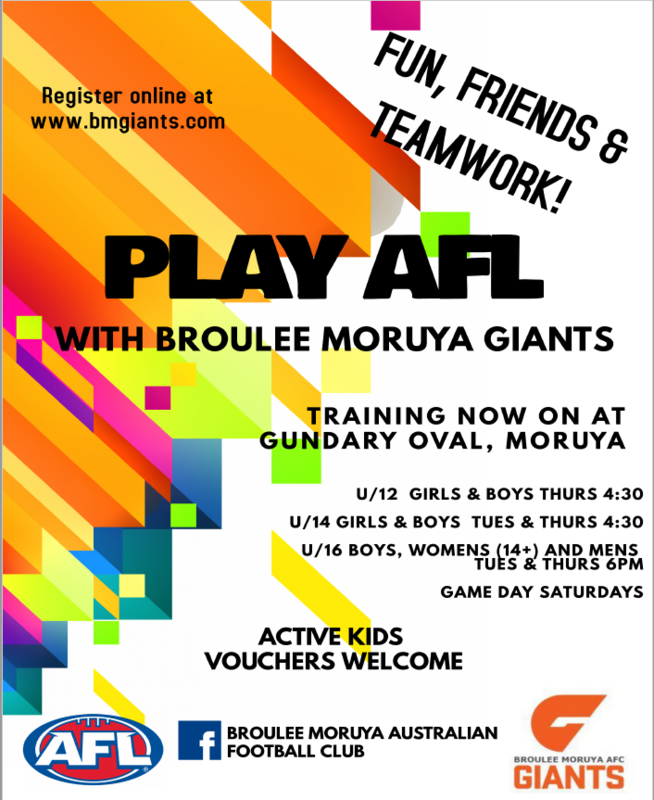 Please encourage your child’s participation. The 2020 Enrolment Period is fast approaching. We welcome prospective Year 7 families to the College on Monday 6 May (Week 2, Term 2) for an Information evening from 4.30pm – 6.30pm. This year in Spring, the three Catholic schools St Mary’s, St Bernards and Carroll College are planning to hold a ‘Lollapalooza’ in and around the Carroll College campus. Carroll College is a central location within the Eurobodalla. What is a Lollapallooza you ask? Lollapalooza = Something excellent! Many hands make light work. Each school will be responsible for different stalls and events or in some cases will work together. This is an opportunity to bring the three school communities together and improve engagement between staff, students, parents and the wider community. We will also be able to showcase what each school has to offer. We hope to have much fun along the way! Some of the ideas to date (but not limited to); Art Show, Music Festival, upcycled designer fashion and fashion parade, henna tent, face painting, gifts, curries, coffees, market stalls, plants, produce, cakes, food, short film competition, sport, raffles, cadets, dance, food, science experiments, design and agriculture. Local organisations and small businesses are invited to be part of this event. A group email is being organised to keep everyone informed. A date will be advertised shortly. Hoping to hear from you soon with more ideas! 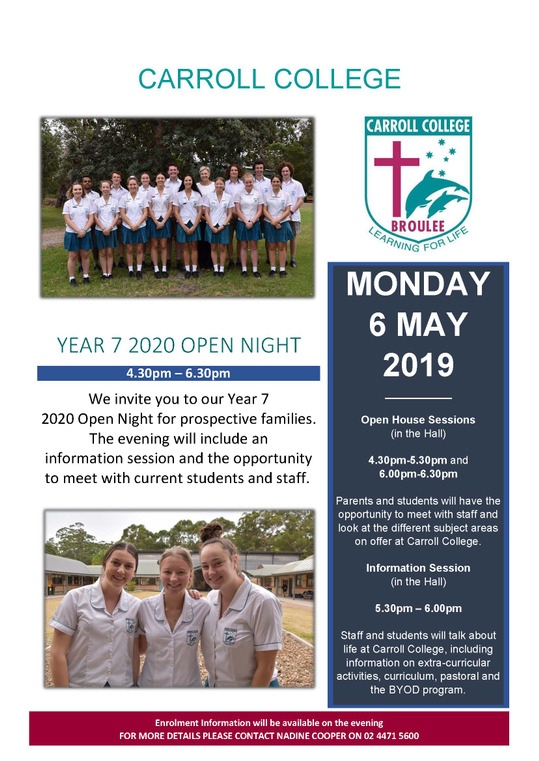 Catholic Schools Week (CSW) 2019 will commence on Monday, 6 May (Week 2 next term). This aligns with the commencement of our official enrolment period. The theme this year, ‘Engaging Faith, Minds and Community’, best describes the Catholic school experience. It illustrates our holistic approach to educating children to become adults who personify Catholic values and serve their communities. The theme highlights the faith based nature of our System schools while emphasising our inclusiveness – that all are welcome. The theme allows teachers and students to explore all of its aspects focussing on what makes our schools unique, in particular the richness of our Catholic school communities. Faith – placing Christ at the centre. Minds – inspiring achievement and the fulfilment of each child’s potential. Community – to become valuable, caring members of the school and extended community. Our Schools strive to embody these values every day, so it is fitting that they form the theme for celebrating Catholic education in 2019. We have a number of staff that have been accepted to attend high quality Professional Learning in the coming months. Congratulations to Mrs Corrinne Dell who has been successful in gaining a $1500 scholarship and entry into The Advanced Leadership Program. This is a National Excellence in School Leadership Initiative - Woman’s Leadership Program. Congratulations also to Mrs Michelle Katuke, Mrs Catherine Davis, Mrs Catriona Colalillo and Mr Nathan Mansfield on being accepted to attend the 8th Aboriginal and Torres Strait Islander Catholic Education NSW State Conference. This is being held in September in the Hunter Valley. Very soon we will enter into the most important time in the Church’s Year – Holy Week. Holy Week commences with Passion Sunday (Palm Sunday), the week prior to Easter. Palm Sunday will be celebrated on the first Sunday of the school holiday period. The following Thursday is Holy Thursday (The Lord’s Supper) and marks the end of Lent when the Church begins the celebration of the Evening Mass of the Lord’s Supper. This Mass begins a three-day liturgy – known as the Easter Triduum spanning Friday, Saturday, and ending with evening prayer on Easter Sunday. This three-day period allows time to truly experience and appreciate this tremendous mystery. Easter liturgy times are published in Parish Bulletins. We welcome Juliette Pierre to the College this week as our new Youth Minister. Juliette will be working predominantly with Mrs Drewson, Mrs Nicoletti and the Faith Formation Student Leaders. Wishing you and your family a happy and holy Easter. Monday 29 April and Tuesday 30 April are student pupil free days. Students commence Term 2 on Wednesday 1 May 2019. It has been very pleasing this term to see the amount of positive student participation in the many extracurricular events that the College takes part in. 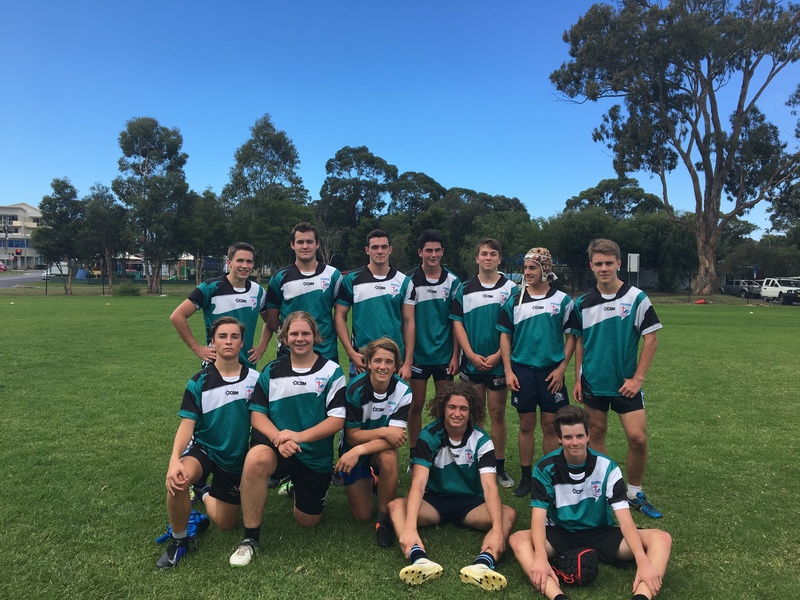 The many activities that students have positively engaged in such as Rugby Union, Rugby League, Basketball, Netball, Swimming, Athletics, Music, Public Speaking, Youth Council, the school play and the other countless activities that have taken place give students a sense of belonging and build community. Community is at the core of our Positive School Wide Behaviour Strategy which creates an ethos at the College which supports learning, participation and supporting each other. We endeavour as a College to demonstrate to students how to behave appropriately and uphold the College Core Values of Being Christ-Like, Respecting All, Aiming High,Being Proud and Celebrating Success. Otherwise known as our BRoulee ABC! School-Wide Positive Behaviour Strategies (SWPBS) is an evidence-based framework for modelling positive behaviour in schools. It creates a positive school climate, a culture of student competence and an open, responsive management system for school leaders, staff, students, parents/carers. SWPBS include support systems for establishing positive school culture, learning and teaching environments and individual student plans to achieve academic and social success for all students. The College actively promotes the safe, respectful and orderly learning environment for all students and staff. Our staff care for the students and the students care for each other and regularly students come to the Pastoral Office with some concerns about other students mental health and wellbeing. This is a positive confirmation that we are doing things right. Over this term, many families have received positive emails and phone calls from staff letting parents know the great things that their child has been involved with at Carroll College. This is in support of our pastoral goals as a College community being to ‘‘catch students being good’. 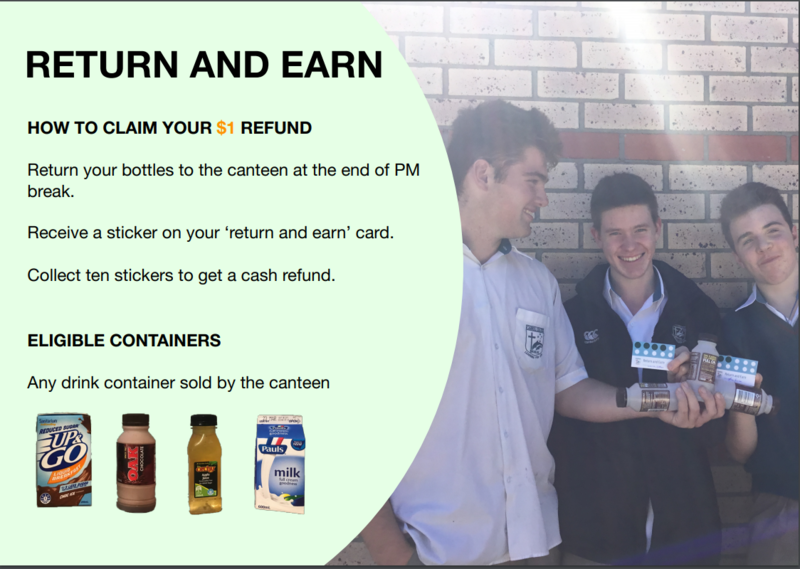 Students are also awarded House Points through Sentral which the students can ‘cash in’ for rewards and accumulate towards the House Cups. The College encourages as many students as possible to take part in the march’s to support those who have fought for our great inclusive country we have today. Last week we completed testing of all Year 7-10 students in PAT-R and PAT-M online tests. The data from these tests will be used as a bench mark for our students. These tests are designed to measure learning over a period of time, so the testing will be replicated later in the year and then evaluated by Catholic Education to ensure that we are adequately meeting student needs. This week we ran a practice online NAPLAN test for the students in Years 7&9. I am pleased to report that the testing went very well, without the many glitches that occurred last year. 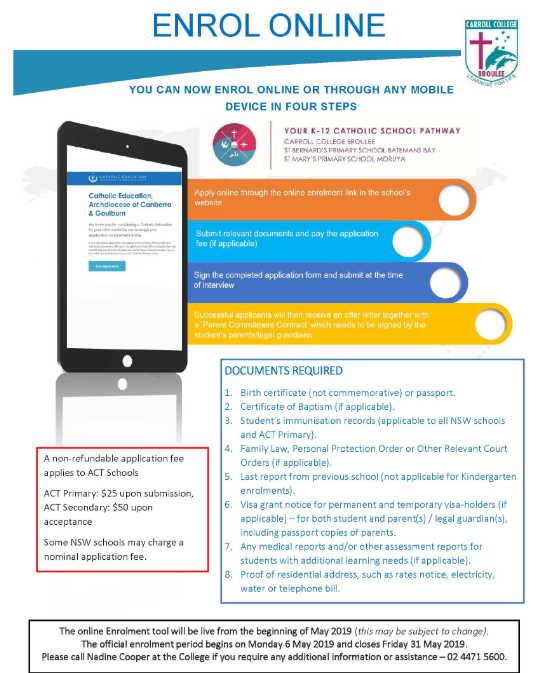 If you are wishing to exempt your child from sitting the NAPLAN tests next term, the school must receive your written notice before May 3. Please complete the attached paperwork and return ASAP. I would like to thank all the students who co-operated during these testing windows. Year 12 students will be receiving their mid-year reports next week. This is a valuable time to assess their approach to their studies. If their reports are pleasing and they have worked hard to get good results in assessment tasks and class based tasks, then they are probably on the right track. If their reports highlight areas needing improvement, then they should change their approach. Year 12 students should be doing between 2 and 3 hours of homework and study each night if they expect to do well in their HSC, after all, they are in competition with the other 65,000 students in NSW! This time each evening is not just for completing homework or assessment tasks, but for going over class notes, summarising them, linking new information to previous notes, drawing mind maps, labelling diagrams, making dot point summaries, etc.etc. The more study they do along the way, the easier it will be as the Trial exams and HSC exams approach. As the term draws to a close, there are still many assessment tasks that will need to be completed. Please ensure your child is still chipping away at them and getting them in by the due date. Wishing you all a great break over the coming holidays. Congratulations to Aiden and Tom Gaffey, Jack Grant and JC Lole-Ngarima for their selection in the CCC Southern Country Rugby League Team. We are very pleased to welcome our new Parish Youth Minister, Juliette Pierre to the College. Juliette is from Bundoora, Victoria where she was a member and leader of the Immaculate Youth Group. Juliette enjoys travelling and seeking opportunities to see and do new things. In her free time Juliette writes, volunteers and plays soccer. As part of the New Evagelization, Juliette will work towards generating new and creative ideas to share the Word of God and assist the youth in ways to develop a deeper connection with God. Juliette is excited about her role here and in the Parishes of St Bernard’s and Sacred Heart. 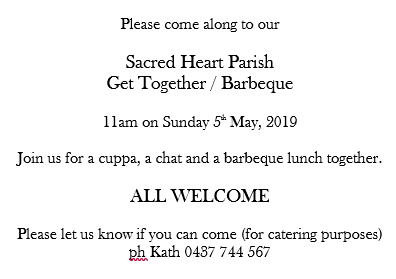 She is already beginning to meet our students and will be working with the Year 10 CSYMA class to prepare and present the Easter Service on Friday 12 April. Easter Service - written by Damia O’Loughlin, Year 10. On the 12th of April, at 10:00 am our Year 10 CSYMA (Catholic Schools Youth Ministry Australia) class will be performing the College’s annual Easter service. This is an incredibly important event for us as a College not only for the students, but for our Catholic community as a whole. Each year our CSYMA produces a breathtaking service, focusing on different issues impacting the youth such as bullying, self-esteem and social media. These themes are then tied together beautifully with the annual topic of Easter. You can always tell by the absolute silence echoing throughout the hall at the conclusion of the service that the whole community feels more connected with each other and connected with God. This years service is shaping up to be even more spectacular and is definitely an event not to be missed! Youth ministry is a program designed to help teens mature and grow as humans, while assisting them to develop their own ideas, values and faith. These programs are beneficial for the students to develop their spiritual wellbeing whether it be through Catholicism or not. The youth ministry program acts as a direct response to the real interests and needs of the youth. This allows our generation to be equipped with all the tools we need to handle ourselves as adults and be confident in our spiritual selves. This event is important not only for our students, but is also invaluable for the parents of our community. Youth ministry is most effective when we join together as a community to support kids as we become more mature and develop the skills we need for life. Through these programs, parents can demonstrate the importance of spirituality as the primary role models of their children. For youth ministry to be effective in helping our students, parents must be involved to in order to build a stronger community within our faith. This is why we strongly encourage parents to come to the Easter service to be a part of our community. Being a Catholic school, these events are very important to our community. It’s important that the youth get involved in these services as they understand, better than anyone, what it’s like to be a teenager in this day and age. There are many issues that affect teenagers these days that adults may not fully understand. Youth Ministry is important for helping teenagers to find faith and allowing them to find guidance when they need to reach out for assistance. Young people can more easily connect and relate with each other and can help each other to develop their faith. Through this process, they can develop stronger bonds with each other and create lifelong friendships. Our Easter liturgy is very important to our students. The liturgy promises to be an engaging and thought-provoking show that takes on real problems affecting our youth. Come down to Carroll College on the 12th of April, 10:00 am, to show your support of the hard work our youth ministry class has put into making this an unforgettable experience for our community. This week I would like to discuss the issue of mobile technology and its place in adolescents’ lives. To make it clear from the outset, ethere is a difference between habitual use of smartphones and other devices and the issue of addictive behaviour itself. Let’s make that clear. The distinction between leaving a device on all day and never leaving the home without it is manifest. There is evidence though of increased levels of mobile device use based on gaming and associated applications. Adolescence is a time of change and increasing influence of the peer group and thus communication amongst peer group members is central to the identity of the individual. The impact of the mobile phone on peer relationships has transformed the peer group into a truly networked society. We have all experienced the spectacle of people at a dining table so immersed in technology that human interaction suffers. I once witnessed a grandmother sitting at a restaurant alone with her thoughts as the children stared at their blue screens. I recently had the opportunity to view one student from my classroom window who spent his entire recess on a phone while friends interacted with each other around him There is a time and place for everything but I would argue that breaking bread together in a meal or a friendship table require full engagement with others. There is a correlation between these devices and slot machines and studies have shown that thee over-use of such technology may have a detrimental influence on memory and deep knowledge. Strategies such as the maintenance of supportive parent–child relationships that encourage disclosure, parental involvement in the activities of their children, and the avoidance of overly restrictive or coercive monitoring will help to support adolescents and keep them safe online, just as they do offline. Mobile phones and other devices are here to say. The technology is not the problem, only the frequency and the level of immersion in it. We adults must model appropriate moderation in our own lives, particularly at the dinner table, during family time and at social functions. It is easy to use it as a child -minding device but there are other pleasures in life as well. Beranuy, M., Oberst, U., Carbonell, X., & Chamarro, A. (2009). Problematic Internet and mobile phone use and clinical symptoms in college students: The role of emotional intelligence. Computers in Human Behaviour, 25, 1182–1187. Carbonell, X., Chamarro, A., Beranuy, M., Griffiths, M.D. Obert,U., Cladellas, R. & Talarn, A. (2012). Problematic Internet and cell phone use in Spanish teenagers and young students. For more information on College events and other calendar dates please visit Sentral. The Carroll College community would like to warmly invite all mothers, guardians and grandmothers to our annual Mother’s Day Breakfast on Thursday 9th May from 7.30 am to 8.30am in the HUB. Come and join us for croissants, tea and coffee with your child/ren. 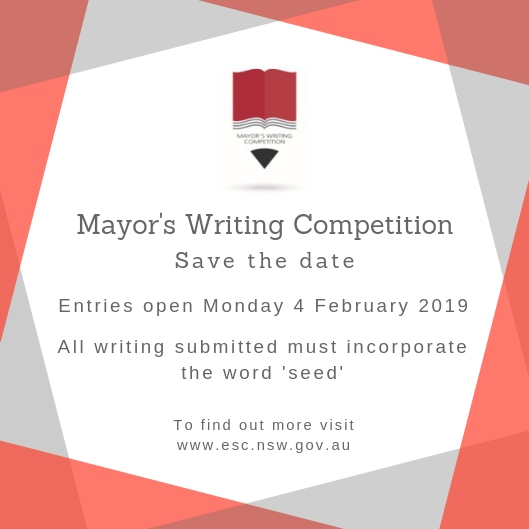 Letters will be emailed early next term. First Yr 10 Work Experience of the year! 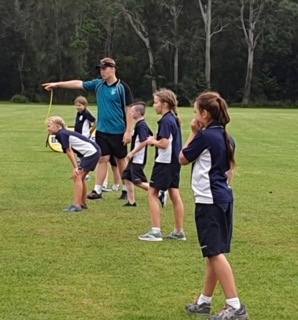 Sam Heffernan and Caleb Piper worked for the Brumbies at a Gala Day in Surfside last week. More information for year 9 and 10 students wishing to participate in work experience will be issued early next term. This year Carroll College will be participating in the Woolworths Earn & Learn program. The program allows schools to earn points to purchase equipment. We have included a sticker sheet to print off (or you can get these at your local Woolworths) and a FAQ sheet. A box will be available at the school near the office for stickers to be dropped in. Earn & Learn runs from 1 May to 25 June 2019.